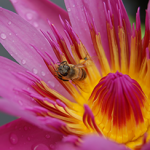 One of the most fascinating plants for the backyard pond is the waterlily. 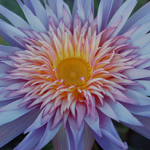 Waterlily blooms come in a wide array of colors including blue, purple, red, white, pink and even green! The flowers can appear to be placidly floating on the surface of the water, or they can majestically rise above the water’s surface. Foliage color can be equally diverse and dramatic, with colors ranging from the palest of greens, to the darkest of greens, to a deep crimson, to a green with boldly contrasting black mottling. Some lilies have leaves the size of a fifty-cent piece, while others have leaves so large a small child can sit and float on them! 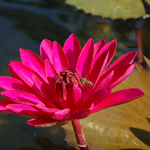 The choices in waterlilies are practically infinite. Tropical Day bloomers flowers open in the morning and close in the afternoon each day for 4-5 days before the flower is spent. A new bloom is usually there ready to take its place. It is quite common for a well fertilized plant to stay in constant bloom all summer, often with multiple blooms open at one time. 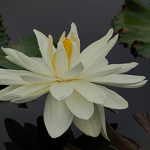 Click here to read a special history on the ‘Lindsey Woods’ waterlily pictured above. Night Blooming lilies, just as the name implies, open their flowers at night just after dark. The flowers will stay open until 10 or 11 AM before they gracefully close. Just like the day blooming lilies their flowers last 4-5 days. Constant and multiple blooms are common on a well fertilized plant. Flower colors for night bloomers are very vivid shades of pink, red, or white. 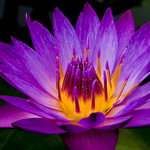 Most water lilies and other aquatic plants preform very well in the Houston, TX area. You can be assured that we here at Nelson Water Gardens will have only those waterlilies that are proven to thrive in our hot, humid, and, seemingly, endless summers. Here are a few tips on how to ensure that you grow the best plants possible.